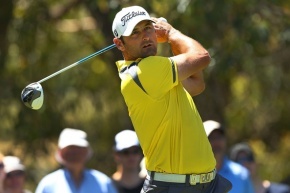 Kiwi Michael Hendry and Spain's Alejandro Canizares took the opening day honours at the Perth International, but Australian Greg Chalmers and England's Paul Casey loom as the danger men at the $A2 million ($NZ2.52 million) event. Hendry and Canizares shot seven-under 65s to set the early standard, with 20-year-old Argentinean Emiliano Grillo one shot further behind. Big guns Jason Dufner and Charl Schwartzel failed to live up to their reputations with one-under rounds, but former world No.3 Casey is well placed at five-under after a bogey-free round. World No.24 Bo Van Pelt finished at two-under. Hendry, the world No.574, missed five straight cuts after winning the NZ PGA Pro-Am Championship earlier this year. But after taking some time off during winter, Hendry feels his form is slowly returning, especially after last week's seventh-placed finish at the China Masters. "My form had been a bit rough but I saw a few glimpses last week in China and it's just nice to carry on," Hendry said. "When you're playing bad and you're spending lots of money to get to events and not getting a lot of return on that investment, it does put a lot of pressure on you to play well. "But you just keep working hard and hoping it turns the corner at some stage, and it has the last couple of weeks." Chalmers, the defending Australian Open and PGA Championship winner, shot a solid round of four-under 68 to be just three shots off the pace. And in an ominous warning to his rivals, the world No.58 is confident he will improve over the coming days as he acclimatises to the conditions. "Look, two days ago I was in Dallas, Texas," Chalmers said. "I made a couple soft bogeys just purely out of my brain feeling a little like a mashed potato. "I'm happy to get in at four-under; really pleased. "I'm getting better every day." South African Schwartzel, who won the 2011 US Masters, was full of fighting words despite being six shots off the pace.